I bet the first images that flood most minds are lions, vast vistas of endless grasslands, maybe a red and white clothed Maasai leaping up and down about to introduce Eastenders on the BBC. It always seems odd to me that such a vast continent suffers from such a derisory public relations effort despite having the tireless, crusading Bob Geldof on its side. Commandeered as an enormous backdrop for the would-be Attenboroughs of the rest of the world, Africa has been the wildlife wonder of the planet since lenses were ground from the sands. Its southern tenth has attracted the world's attention for rather less than aesthetic reasons (that's if you don't include Botswana and Alexander McCall Smith's rosy view of the country via his Lady Detective Agency series of novels). The crux of Africa's problems always seemed to come from miserably grim, European intervention and rule. I'm reminded of the sorry state the country is in by that neat little anti-missionary aphorism: "When the white man arrived we owned the land and they had the Bibles. They taught us to pray and when we opened our eyes, we had the Bibles and they owned the land." It would be interesting to speculate what Africa would be now untouched by white bureaucracy, Christianity and colonial rule. But there was no way that such a jewel of a country would remain hidden, especially not from eyes beady with visions of wealth and status. And this, I believe, was one of the more insignificant reasons the genocidal violence in Rwanda was so terrifying, so shocking. White people seemed to have nothing to do with it (we can't blame us). And after the violence erupted, we still wanted to have nothing to do with it (we can shame us). In Hotel Rwanda, Joachim Phoenix's cameraman asks the obvious question: "What is the difference between Hutus and Tutsis?" Or to boil the question down to its fundamentals: why are Africans killing Africans? The answer he gets is unsurprising if a little simplistic. The original colonial Belgians divided up the populace by employment and very broad physical characteristics. It's generally believed that the Hutus are farmers and the Tutsis a pastoral people. Physically, it seems, the Tutsis are merely taller. Up until about 1980, a school of thought known as Essentialism held sway in Rwanda - the belief that you could not change what you were, what you were born to be. Your very life was fixed. This and a profound lack of basic education fuelled inter-continental racism until something snapped. And something snapped loudly and horrifically in Rwanda. Working in Africa (granted a mere decade ago), one quickly realised that western ideals and practises are seen as curios in a land where cocktails are served for the white tourist elite, costing as much as the man or woman who serves it earns in a month. Time operates in odd ways. Pre-arranged appointments with officials are quite often breezily forgotten or 'squeezed in' sometime in the working day. What Europe and the US brought to Africa in the more enlightened period of history (maybe Mandela's release could be the year things started to get better) is proof that beyond a hand to mouth existence there is a luxurious life to be had 'out there'. The guy who drove me on a documentary recce in Tanzania asked me to bring him back a Nikon camera (he went so far as to have specified the lenses he wanted) and he wasn't kidding, so deep the illusion of great white wealth is wedged in the minds of the average African wage earner. The white man also brought the all too visible (but alas unaffordable) trappings of an enviable lifestyle. In Hotel Rwanda, small minded, violent men prize the smallest things we take for granted. Most of the brutes portrayed in the movie are appeased by the odd bottle of spirits, the crate of beer ("…for your men who must be very thirsty…"). But beyond that, the eccentricities of the Western culture (and from an African perspective, they are hilarious eccentricities) simply don't count here. What counts is raw power and that usually means the biggest brute with a gun or machete. I think I may have just stumbled on a parallel universality. Surely Uncle Sam is the biggest brute with the biggest gun. It's just in Africa, the violence is so immediate and not cloaked in political rhetoric or justifications that would make even Homer Simpson blush. I mean, did anyone see Bush at a press conference a few weeks ago saying that Syria really should move its troops out of Lebanon? I think I actually barked hearing him say that. Light simply cannot escape from the colour of Bush's pot. There is a sublime moment in Roger Spottiswood's Under Fire. This particular genre could be called 'Hero Journo in Dangerous Foreign Climes'. When a country destabilises due to coups, insurrections or civil war, the threat of meaningless and instant death is always around the corner. It's the scariest threat of all because it is avoidable IF you can outwit the brutes with guns, or IF you know exactly the right thing to say. Your life is in your hands and minds quite literally. Gene Hackman, watched by heroic photographer Nick Nolte, blithely negotiates passage with a group of rebels seen in a long shot. Hackman is an American. He is even dressed in white. He is assured, confident and the next second very dead in a terrible shock of realism in a film that up to this point has certainly resonated but not really caught fire. Hackman's superbly performed death (like a marionette with its strings cut) slams Under Fire into a third gear. NO ONE is safe. Films in this genre trade on this never-ending presence of death on a whim, a sort of Caligula-Effect. Hotel Rwanda falls into this genre despite the hero, Paul Rusesabagina, being African. Paul is played with restraint and dignity by American Don Cheadle, his African accent here a little more convincing than his English Cockney in Ocean's 11 and 12. Joachim Phoenix's character (news cameraman, Jack) expresses very accurately what the rest of the world sees as Africa. It's just that place where there are lions, where bad things happen and we then return to our full Western plates and push our snouts around the bounteous trough that is Western culture. In some ways it's inevitable. People who have 'x', have lived with 'x' all their life, take 'x' for granted. 'X' can be health care, food, water, civilisation and the assumption that tomorrow morning all the Scots won't wake up, hear of a plane crash, blame and then slaughter (with machetes) all the Welsh - including the children (to stop them from breeding). It is inconceivable. In the middle of this escalating carnage is a mid-level hotel manager trying to keep his family (he is Hutu, his wife Tutsi) and innocents safe. As the situation worsens and Tutsis are being killed on sight, the hotel becomes a haven or ark for the displaced. Nick Nolte (again) plays Colonel Oliver, a fiercely proud UN soldier whose job it is to keep the peace - not maintain it indefinitely nor militarily enforce it. Like the British soldiers in Bosnia, politically forced to pull out of a region knowing that those they leave behind will be slaughtered, Nolte is man torn by political expediency and decent human values. His real relationship with Paul is human and touching. They do not see skin colour or nationality but respond to a situation as intelligent men. Nolte's "You're dirt" speech is telling and all the more horrific for being true. "You're worse than niggers," he tells Cheadle, savagely parodying the voice of his superiors' subtext in their orders to pull out. "You're African." Similarly, Sabena's Belgian Flight Company President who runs Paul's hotel from Europe is shocked to learn that his employees are all about to be hacked to death. Extraordinarily, he has enough clout to call off the attack on the hotel via the French (whom the film states are giving the rebels the arms they need). Played by Jean Reno, now moving into dignified middle-aged roles (and sadly, middle aged roles in adverts for DHL), the President offers Paul a lifeline. He's been deftly manoeuvred into doing just that. Paul calls him up to say good-bye as he will be slaughtered soon. That news tends to make decent people act. When money is involved, the world shifts. How dreadfully cynical is that? But Paul knows this, exploits it, makes it work for him on a personal level. Something that Hotel Rwanda explores very well is the effort made by Paul to join the white elite, to become (in his eyes) an efficient, civilised man whose talents are prized in the wider world. It's a club his skin will never let him join (the irony of a famous Hollywood star with the same colour skin enjoying the west's best on his days off is never far from the surface but all power to Cheadle for taking the role on). The film underlines his shock at being left behind as all the pasty skinned tourists and religious helpers (yes, I admit, the clergy are looking after the disadvantaged) are thrown out, some reluctantly and some with great relief. Directorially, Terry George (much like Eastwood with Million Dollar Baby) gets out of the way and just tells the story. This is good simply because Hollywood is a great medium (if the film is made well enough and not cloying and righteous regarding its 'true story' origins) for communicating injustice. It may have no tangible 'real-world' result but at least someone can learn something by sitting down and giving a few hours to one of mankind's most striking acts of communal violence. The two elements that stop the two thumbs piercing the atmosphere are the ending and the music. Unwisely, it's scored very conventionally. This means that just as you are gearing up- to be affected by these awful images, the music steps in and says "Just in case you don't get it, THIS IS TERRIBLE, feel baaaaad!" Hotel Rwanda needs none of this and mercifully the instances the music pushes forward and becomes noticeable are rare. Then we have the need for an ending and it's a Hollywood doozy. Trouble is, it's true, albeit probably time-shifted to serve as the climax of this solid and respectful movie about one of Africa's darker periods. I can't complain. 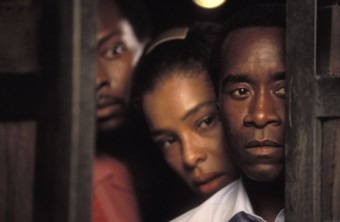 Hotel Rwanda is worthy film making in the best tradition of that much-maligned term.